I heard a sad story today about a teen who bagged a pileated woodpecker with his varmint rifle. No one knew what it was — “Ain’t seen one before, ain’t seen one since” — but his family praised his marksmanship, and the lad cut off the feet to carry as a trophy or talisman. The hunter takes on some attribute of his prey, puts on his power, becomes a kind of shaman mastering two worlds living and dead, social and natural, known and unknown. 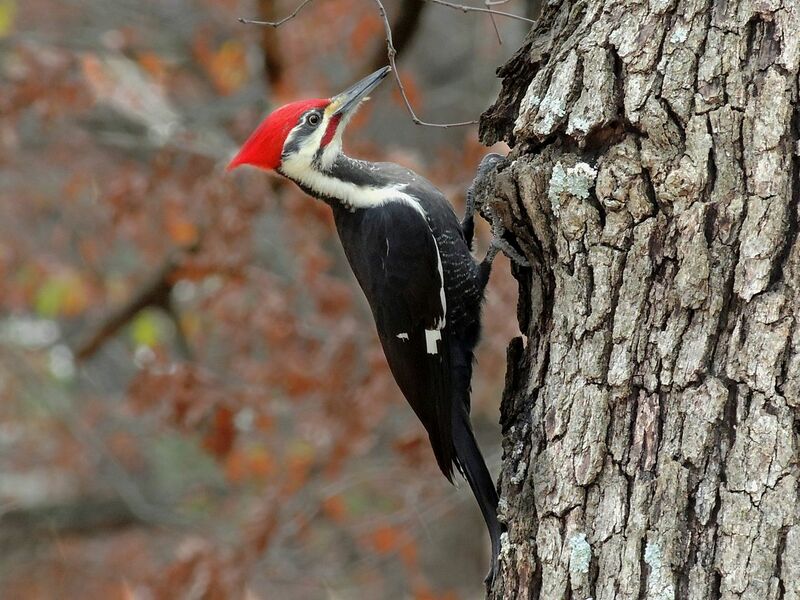 Josh Laymon’s photo of an adult pileated. On such ears a phrase like “protected under the U.S. Migratory Bird Act” sounds merely political, evoking oily bureaucrats in distant urban centers while having nothing to do with our species’ place in history, nothing to do with our habitat, nothing to do with who we are — much less with the bird’s place, habitat, or being. New to the neighborhood he was, that brazen forager. We don’t take kindly to strangers in these parts. What the hell do you do? Getting the kid to register his .22 in a national database would not only violate his second-amendment rights, but wouldn’t have granted the bird a single heartbeat. Conversation about gun violence has to begin at the other end, in a wholly different place, a place almost of magic. We need that shaman, that interlocutor, that priest of all that is holy to help us see. There’s more than one gun culture in this country: one of them respects nature, admires the elegance of a well-crafted firearm, contemplates the chthonic dimension of fashioning lead, copper, wood, steel from the bowels of the earth into stocks and chambers and cartridges that we use to hunt, to offend, to kill: and that knows life ends life to live. There’s another gun culture that regards the first as hopelessly old-fashioned. I wrote and produced a 14-minute monologue this year called Gunplay: The Rifle Report, which tries to circumvent the emotional wrangling about guns by re-contextualizing a single story, one tiny piece of the puzzle — letting the audience hear from a Remington .30-06, an American Enfield with a rich history. Actress Abby Overton, who created the role, will reprise it in a filmed version we’re working on this summer. We’d like an audience for Abby to work with, especially as it’s a very intimate play. . .
Wednesday, August 13 at 7:30 at the Arts Center in Carrboro, NC. Let me know if you’re coming.